No day of skiing would be complete without the magic of a mountain hut. A stop-off for refreshments on the Culinary Pathway for Hut Lovers leads to experienced hut proprietors and “award-winning ski chefs” along the ski slopes in SalzburgerLand. You’ll be surprised by these innovative hosts with outstanding hut meals such as local wild game and beef specialities, crispy fresh salads, creamy soups, dumpling and noodle creations, as well as vegetarian dishes, homemade flour-based dishes, cakes and pies. Health-conscious guests can enjoy the healthy hut specialities. Even vegetarians and vegans will also be pampered with amazing dishes in the mountains of SalzburgerLand. 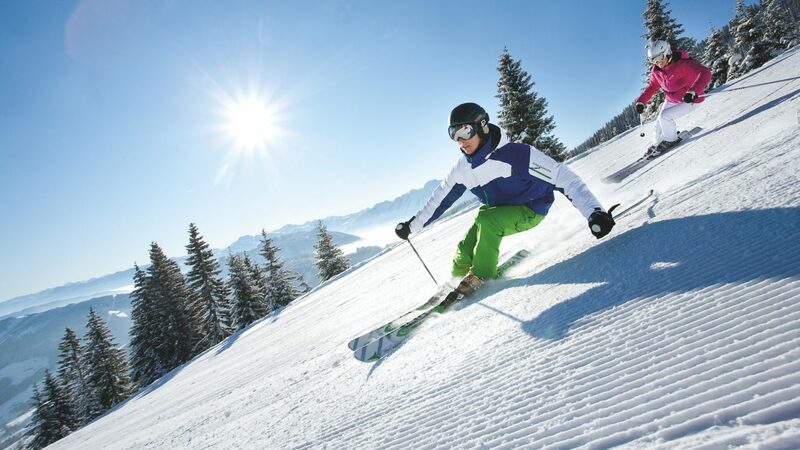 Winter sports enthusiasts can hardly wait until the slopes in SalzburgerLand once again invite to sheer boundless skiing pleasure. The skis are waxed and the board is ready. Each trip up to the summit delivers more of a panorama with every metre and once you arrive at the top, your winter paradise adventure begins. Experience the slope with every swing and curve – this is how the cold season shows its most beautiful side. The snow crystals glitter, the powdery snow rises and your internal voice knows that this is exactly how beautiful winter is in SalzburgerLand. Under the motto “Gourmet in the Snow”, winter sports enthusiasts will find special ski hut delicacies on the menus in the 20 ski huts along the Via Culinaria “Culinary Pathway for Hut Lovers”: in cooperation with Salzburg’s well-known top chefs, proprietors and chefs at mountain huts have created a special Via Culinaria ski hut delicacy that can only be tasted exclusively at this respective hut. For instance, Rudi and Karl Obauer have invented the O-Power Soup Bowl for the Burgstallhütte in Flachauwinkel. The Gehwolfalm in Großarl pampers its ski guests with an original “Großarler Hüttenmaus”, and at the Bürglhütte in Dienten you can enjoy the delicious dessert known as Moar im Pfoad. Thus, the perfect stop-off for refreshments is guaranteed! Whether summer or winter, spring or autumn – all year round the “taste addresses” serve their award winning delicacies. Such as at the Treff 2000 in Obertauern. The motto “Mountain High Life” is the programme here with fine dishes, a great atmosphere and stunning views. An Alpine restaurant, just like in the books, is the Weitmoser Schlossalm, high above Bad Hofgastein. Here at about 2,000m above sea level, they serve regional delicacies against a breath-taking panorama, while in the Alpine Wine Shop wine connoisseurs find their own personal heaven. 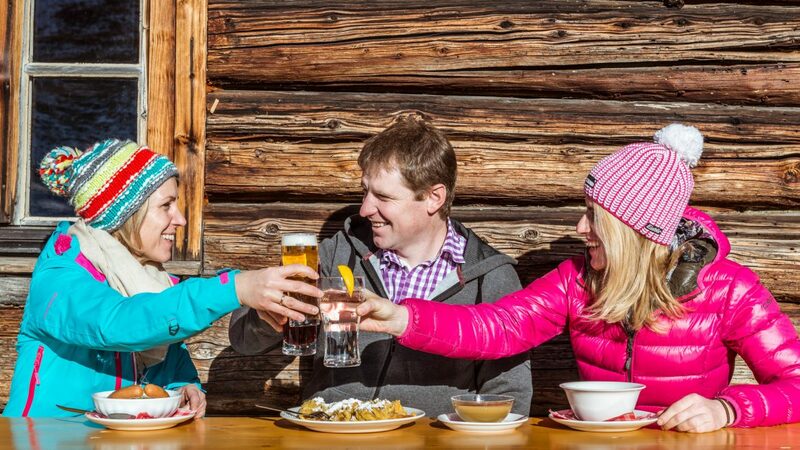 The finest Aprés Ski is experienced by party-people on the Lisa Alm in the Ski Paradise Flachau. In Saalbach-Hinterglemm, the Kröll family on the Wieseralm invite you to taste regional pleasure. For those who would like to visit the highest located Beer Brewery in Europe, the Asitzbräu with the Restaurant Alte Schmiede in Leogang invites you to stop-off, be amazed, taste and enjoy. Depending on your mood and desire, you can enjoy hut magic in rustic, tradition-steeped mountain huts or in modern gourmet lounges. Many of these mountain huts also attract visitors in the summer with regional delicacies from their own farms as well as with homemade cheese & bread specialities and oven-fresh flour-based dishes. Many Alms still make their own cheese, such as on the Loseggalm. Bound to tradition and yet still open for modern interpretations, selected mountain huts in SalzburgerLand offer meat-free specialities and vegan delicacies such as in the Hochkönig Region.